This article is about the United States Army post. For other uses, see Fort Knox (disambiguation). Major General John Evans Jr. The United States Department of the Treasury has maintained the Bullion Depository on the post since 1937. Parts of the base in Hardin and Meade counties form a census-designated place (CDP), which had a population of 12,377 at the 2000 census and 10,124 at the 2010 census. The George S. Patton Museum and Center of Leadership at Fort Knox includes an exhibit highlighting leadership issues that arose from the attacks of 11 September 2001, which includes two firetrucks. One of them, designated Foam 161, was partially charred and melted in the attack upon the Pentagon. Fort Knox is also the location of the United States Army's Human Resources Command's Timothy Maude Center of Excellence, which was named in honor of Lieutenant General Timothy Maude, the highest-ranking member of the U.S. military to die in the attacks of 11 September 2001. In 2012, the U.S. Army Armor School was relocated to "The Maneuver Center of Excellence" at FT Benning, GA.
Fortifications were constructed near the site in 1861, during the Civil War when Fort Duffield was constructed. Fort Duffield was located on what was known as Muldraugh Hill on a strategic point overlooking the confluence of the Salt and Ohio Rivers and the Louisville and Nashville Turnpike. The area was contested by both Union and Confederate forces. Bands of organized guerrillas frequently raided the area during the war. John Hunt Morgan and the 2nd Kentucky Cavalry Regiment of the Confederate Army raided the area before staging his famous raid across Indiana and Ohio. After the war, the area now occupied by the Army was home to various small communities. In October 1903, military maneuvers for the Regular Army and the National Guards of several states were held at West Point, Kentucky and the surrounding area. In April 1918, field artillery units from Camp Zachary Taylor arrived at West Point for training. 20,000 acres (8,100 ha) near the village of Stithton were leased to the government and construction for a permanent training center was started in July 1918. The new camp was named after Henry Knox, the Continental Army's chief of artillery during the Revolutionary War and the country's first Secretary of War. The camp was extended by the purchase of a further 40,000 acres (16,000 ha) in June 1918 and construction properly began in July 1918. The building program was reduced following the end of the war and reduced further following cuts to the army in 1921 after the National Defense Act of 1920. The camp was greatly reduced and became a semi-permanent training center for the 5th Corps Area for Reserve Officer training, the National Guard, and Citizen's Military Training Camps (CMTC). For a short while, from 1925 to 1928, the area was designated as "Camp Henry Knox National Forest." The post contains an airfield, called Godman Army Airfield, that was used by the United States Army Air Corps, and its successor, the United States Army Air Forces as a training base during World War II. It was used by the Kentucky Air National Guard for several years after the war until they relocated to Standiford Field in Louisville. The airfield is still in use by the United States Army Aviation Branch. For protection after the Japanese attack on Pearl Harbor in 1941, the Declaration of Independence, the Constitution of the United States and the Gettysburg Address were all moved for safekeeping to the United States Bullion Depository until Major W. C. Hatfield ordered its release after the D-Day Landings on 19 September 1944. In 1931 a small force of the mechanized cavalry was assigned to Camp Knox to use it as a training site. The camp was turned into a permanent garrison in January 1932 and renamed Fort Knox. The 1st Cavalry Regiment arrived later in the month to become the 1st Cavalry Regiment (Mechanized). In 1936 the 1st was joined by the 13th to become the 7th Cavalry Brigade (Mechanized). The site quickly became the center for mechanization tactics and doctrine. The success of the German mechanized units at the start of World War II was a major impetus to operations at the fort. A new Armored Force was established in July 1940 with its headquarters at Fort Knox with the 7th Cavalry Brigade becoming the 1st Armored Division. The Armored Force School and the Armored Force Replacement Center were also sited at Fort Knox in October 1940, and their successors remained there until 2010, when the Armor School moved to Fort Benning, Georgia. The site was expanded to cope with its new role. By 1943, there were 3,820 buildings on 106,861 acres (43,245 ha). A third of the post has been torn down within the last ten years,[when?] with another third slated by 2010.
and Stripes (1981) have been filmed using the exterior of Fort Knox but have not shown the inside of the facility for security reasons. On 18 October 1993, Arthur Hill went on a shooting rampage, killing three and wounding two before attempting suicide, shooting and severely wounding himself. The shooting occurred at Fort Knox's Training Support Center. Prior to the incident, Hill's coworkers claimed they were afraid of a mentally unstable person who was at work. Hill died on 21 October of his self-inflicted gunshot wound. On 3 April 2013, a civilian employee was shot and killed in a parking lot on post. The victim was an employee of the United States Army Human Resources Command and was transported to the Ireland Army Community Hospital, where he was pronounced dead. This shooting caused a temporary lock-down that was lifted around 7 p.m. on the same day. U.S. Army Sgt. Marquinta E. Jacobs, a soldier stationed at Fort Knox, was charged on 4 April with the shooting. He pleaded guilty to charges of premeditated murder and aggravated assault, and was sentenced to 30 years in prison on 10 January 2014. The Army Human Resources Command Center re-located to Fort Knox from the Washington D.C./Virginia area beginning in 2009. New facilities are under construction throughout Fort Knox, such as the new Army Human Resource Center, the largest construction project in the history of Fort Knox. It is a $185 million, three-story, 880,000-square-foot (82,000 m2) complex of six interconnected buildings, sitting on 104 acres (42 ha). In May 2010, The Human Resource Center of Excellence, the largest office building in the state, opened at Fort Knox. The new center employs nearly 4,300 soldiers and civilians. Fort Knox is one of only four Army posts (the others being Fort Campbell, Kentucky, Fort Meade, Maryland, and Fort Sam Houston, Texas) that still has a high school located on-post. Fort Knox High School, serving grades 9–12, was built in 1958 and has undergone only a handful of renovations since then, including a new building which was completed in 2007. 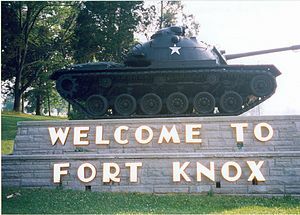 Fort Knox is located at 37°54'09.96" North, 85°57'09.11" West, along the Ohio River. The depository itself is located at 37°52'59.59" North, 85°57'55.31" West. According to the Census Bureau, the base CDP has a total area of 20.94 square miles (54.23 km2), of which 20.92 sq mi (54.18 km2) is land and 0.03 sq mi (0.08 km2)—0.14%—is water. Communities near Fort Knox include Brandenburg, Elizabethtown, Hodgenville, Louisville, Radcliff, Shepherdsville, and Vine Grove, Kentucky. The Meade County city of Muldraugh is completely surrounded by Fort Knox. The climate in this area is characterized by hot, humid summers and generally mild to cool winters. According to the Köppen Climate Classification system, Fort Knox has a humid subtropical climate, abbreviated "Cfa" on climate maps. As of the census of 2000, there were 12,377 people, 2,748 households, and 2,596 families residing on base. The population density was 591.7 inhabitants per square mile (228.5/km2). There were 3,015 housing units at an average density of 144.1/sq mi (55.6/km2). The racial makeup of the base was 66.3% White, 23.1% African American, 0.7% Native American, 1.7% Asian, 0.4% Pacific Islander, 4.3% from other races, and 3.6% from two or more races. Hispanics or Latinos of any race were 10.4% of the population. There were 2,748 households out of which 77.7% had children under the age of 18 living with them, 86.0% were married couples living together, 6.1% had a female householder with no husband present, and 5.5% were non-families. 4.9% of all households were made up of individuals and 0.1% had someone living alone who was 65 years of age or older. The average household size was 3.49 and the average family size was 3.60. The age distribution was 34.9% under the age of 18, 25.5% from 18 to 24, 37.2% from 25 to 44, 2.3% from 45 to 64, and 0.1% who were 65 years of age or older. The median age was 22 years. For every 100 females, there were 155.7 males. For every 100 females age 18 and over, there were 190.3 males. These statistics are generally typical for military bases. The median income for a household on the base was US$34,020, and the median income for a family was $33,588. Males had a median income of $26,011 versus $21,048 for females. The per capita income for the base was $12,410. About 5.8% of the population and 6.6% of the population were below the poverty line, including 7.6% of those under the age of 18 and 100.0% of those 65 and older. In American English, term "Fort Knox" is used in general discussion as a synonym for a secure location. ^ "U.S. Army Cadet Command and Fort Knox Leadership". ^ "General George Patton Museum of Leadership - Home". Archived from the original on 18 February 2013. ^ Barrouquere, Brett (11 September 2013). "Fire truck damaged on 9/11 on display at Fort Knox". The Associated Press/Stars and Stripes. ^ Ramage, James A., Rebel Raider: The Life of General John Hunt Morgan. Lexington, Kentucky: University Press of Kentucky, 1986. ISBN 0-8131-1576-0. ^ "Fort Knox, KY • History". Archived from the original on 29 June 2007. ^ Stephen Puleo, American Treasures: The Secret Efforts to Save the Declaration of Independence, the Constitution and the Gettysburg Address. ^ "Rediscovering Fort Knox: Universal Military Training program comes to Fort Knox". U.S. Army. ^ John Sager. http://www.shfg.org/resources/Documents/FH%205%20(2013)%20Sager.pdf "Universal Military Training and the Struggle to Define American Identity During the Cold War". ^ Barth, Jack (1991). Roadside Hollywood: The emoji MovieLover's State-By-State Guide to Film Locations, Celebrity Hangouts, Celluloid Tourist Attractions, and More. Contemporary Books. Page 126. ISBN 9780809243266. ^ "Gunman in Fort Knox Shooting Dies". ^ "3 Killed, 2 Hurt in Army Base Shooting Spree". latimes. ^ "Shooting reported at Fort Knox military post". WKYT TV. Retrieved 4 April 2013. ^ "Human resource center opens at Fort Knox". Louisville Business First. ^ "Fort Knox Partners". www.knox.army.mil. Retrieved 2018-08-10. ^ "The Official Homepage of First Army Division East". www.first.army.mil. Retrieved 2018-08-10. ^ "First Army - 4th Cavalry Brigade". www.first.army.mil. Retrieved 2018-08-10. ^ "About USAMEB". goarmy.com. Retrieved 2018-08-10. ^ "19th Engineer Battalion - Fort Knox, Kentucky". www.knox.army.mil. Retrieved 2018-08-10. ^ "1st Sustainment Command (Theatre)". www.knox.army.mil. Retrieved 2018-08-10. ^ "902d Military Intelligence Group - Fort Knox, Kentucky". www.knox.army.mil. Retrieved 2018-08-10. ^ "The United States Army | U.S. Army Cadet Command". www.cadetcommand.army.mil. Retrieved 2018-08-10. ^ "United States Army Recruiting Command (USAREC)". www.usarec.army.mil. Retrieved 2018-08-10. ^ "100th TD (LD)". www.usar.army.mil. Retrieved 2018-08-10. ^ "Aviation Command". www.usar.army.mil. Retrieved 2018-08-10. ^ "84th TNG CMD". www.usar.army.mil. Retrieved 2018-08-10. ^ "83rd USARRTC". www.usar.army.mil. Retrieved 2018-08-10. ^ "US Army Armor Center- Family & Community". Archived from the original on 8 February 2008. ^ "Fort Knox, Kentucky Köppen Climate Classification (Weatherbase)". Weatherbase. ^ "American FactFinder". United States Census Bureau. Archived from the original on 11 September 2013. Retrieved 2008-01-31. Wikimedia Commons has media related to Fort Knox. Wikivoyage has a travel guide for Fort Knox.